The landscape depicts a large river flowing through gently rolling banks from one end of the screens to the other -one of the “famous places” meisho, painted since the Heian period (794-1185). It can be identified as the river Uji from the water wheel, the fishermen’s nets and the silvery waves. A series of fans, swept along by the current, punctuate the rhythmically drawn waves; their opaque, vivid colors contrast with the muted tonalities of the silver oxide powder. Evoking competitions of poetical composition and displaying autumnal hues, they suggest the literary climate of the Heian period. The rarity of such a thematic association adds to the outstanding character of these screens. 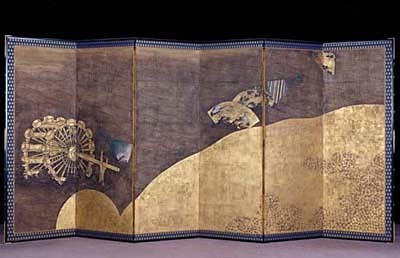 The opulence of the composition with its powerful, sumptuous gold leaf ground is typical of the pictorial style established during the Momoyama period (1573-1603) and the early Edo period. From the 16th century, such screens were among the preferred supports for Japanese painting. Traditionally designed in pairs, they served to partition off interior spaces while appearing as veritable pictorial creations, often expressing the quintessential esthetic of their period. Here, the contrast between a straightforward composition and each meticulously painted fan heralds an innovative pictorial vocabulary specific to Edo modernity, and allows the work to be dated fairly precisely. It appears to follow the blossoming of the Sotatsu style between the 1620s and 1640s. It is a work that both recalls the past and announces the future; the vitality of its stylistic interpretation allow it to transcend the nostalgia of omnipresent literary references and imbues it with much of the modernity of the 17th and 18th centuries. http://www.guimet.fr/wp-content/uploads/2011/10/images_musee-guimet_collections_japon_paire_paravents.jpg 258 400 Super User http://guimet.blacko/wp-content/uploads/2017/07/logo-1.png Super User2012-01-03 15:36:082012-01-03 15:36:08Pair of six-panelled screens: "Fans floating on the river"